Located in the hills with mixed forests and orchards of apples, nuts, and cherry trees, the monastery welcomes us with its ancient walls among whom is raised from several hundred years the beautiful stone church built by ruler Alexandru cel Bun, the first founder of the monastery. At the entrance to the monastery we see the bell given to the monastery by Stefan Cel Mare, whose weight is 800 kg. Stepping inside the church, which is dedicated to the Assumption, we find the tomb of Prince Alexandru cel Bun (1400-1432), son of Prince Roman Musat I, the tomb of Lady Anne, his second wife, the tomb of Alexandrel, the eldest son of Stephen and his sister, Princess Anne. Here is buried Lady Maria, wife of ruler Stephen Lăcustă, son of Alexandrel. In Bistrita Monastery we will meet many pilgrims who came from all parts of the country to visit the ancient shrine, priceless historical monument and to worship the miraculous icon of St. Anna, bestowed by the Emperor of Byzantium, Manuel Paleologu in 1407, and the miraculous icon of St. George. In the monastery museum is preserved a large number of ancient icons, religious books, the famous Diptych from Bistrita, sculptures and frescoes, coins (XVI-XVIII). After all this time of christian spirituality, we start to Bisericani Monastery located at less than 10 km from Bistrita. We are going up the paved road that winds around 5 km on mountain Pietrosu. Bisericani monastery is built at an altitude of 650 meters. The first wooden hermitage was raised in the reign of Alexandru cel Bun. 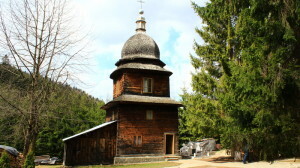 Then Pious Joseph built a wooden church. But the monastery founders are considered rulers Stefan Cel Mare, Stefan Voda, Petru Rares and Alexandru Lăpuşneanu. The first church of wall is of Stefanita Voda (1517-1527). The monastery church, whose patron is celebrating at the Annunciation, has footprint changes made ​​in the reign of Petru Rares (1527-1538, 1541-1546). Between 1626-1631 the church was surrounded by thick walls with defense towers. Currently listed as historic monuments in Neamt County. By 1885, there functioned a prison, then from 1905, the monastic complex was transformed into a sanatorium, but the name and fame of this hearth of faith lived in the hermitage, as an unquenchable flame. Below 500 meters, near the ancient abbey palace, surrounded by 5-meter high wall, it began as early as 1990 to build the church with the same dedication preserved for 500 years and new buildings of the monastery. That is why the council in 1991, raise the hermitage to the rank of independent monastery. In our pilgrimage, before heading for the Pângăraţi Monastery, to which we have to travel about 10 km, do not forget to go to The Cave of Saint Chiriac. At Pângăraţi in 1460, Cuviosul Simeon raised the first wooden church dedicated to St. Great Martyr Demetrius, but that was burned by the Turks in 1476. The prince of Moldavia, Alexandru Lapusneanu (1552-1561,1564-1568), builds in the 1560, on the place of the wooden church, the church of stone, who now we admire. In the church is kept icons of great beauty, illustrating the fame of icon painters from Pângăraţi and the great iconographic schools that functioned here. The spirituality upload that we can experience here is enhanced, probably by the extraordinary panorama that offers the surroundings. We are preparing to continue the pilgrimage to Tarcău valley. From where we stand, Pângăraţi monastery, until there are about 26 km. Tarcau Hermitage Monastery, mentioned in a document from 1832, it is located in Tarcău Valley, between the villages Brateş and Ardeluţa in the heart of the mountain Gosman. Arrived in Tarcău we do left in front of the Forestry District, to Ardeluţa. The road is paved. The monastery church was consecrated in 1833, dedicated to All Saints Sunday, which is celebrated the first Sunday after Pentecost. The bell tower dates back to 1868. Since then, Tarcău Hermitage was hermitage, convent and then again monastery. Since 1991, the hermitage from Tarcau Hermitage has the status of a monastery and is historical monument. With peace and quiet in soul, here ends our pilgrimage which will not take you of your time than a single day.